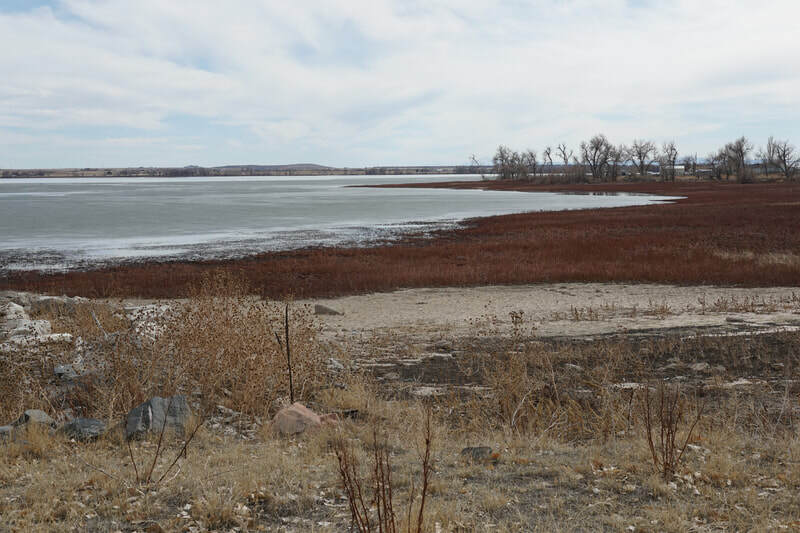 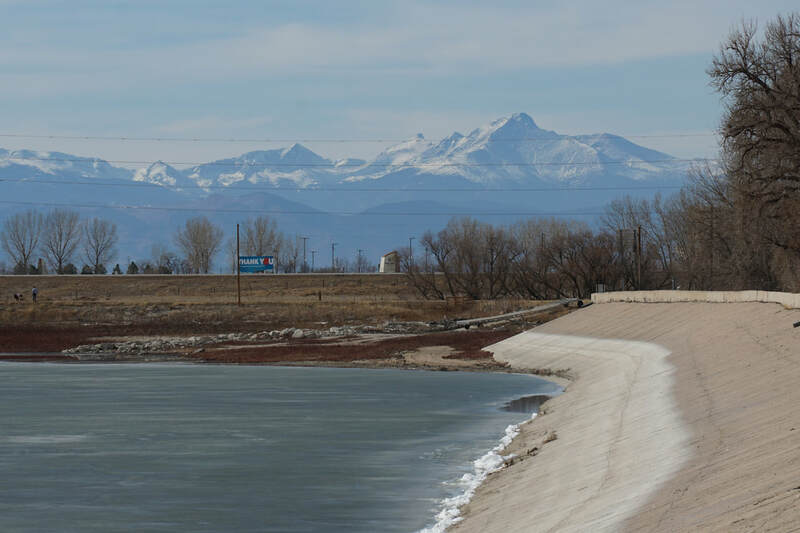 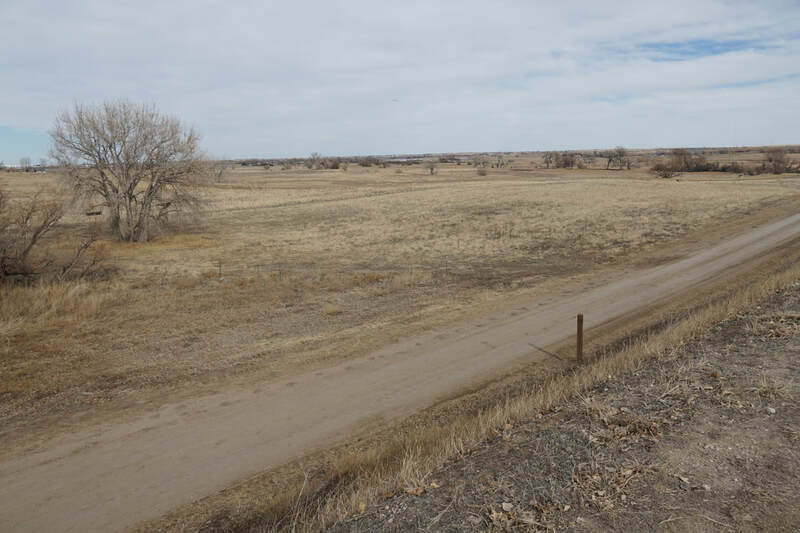 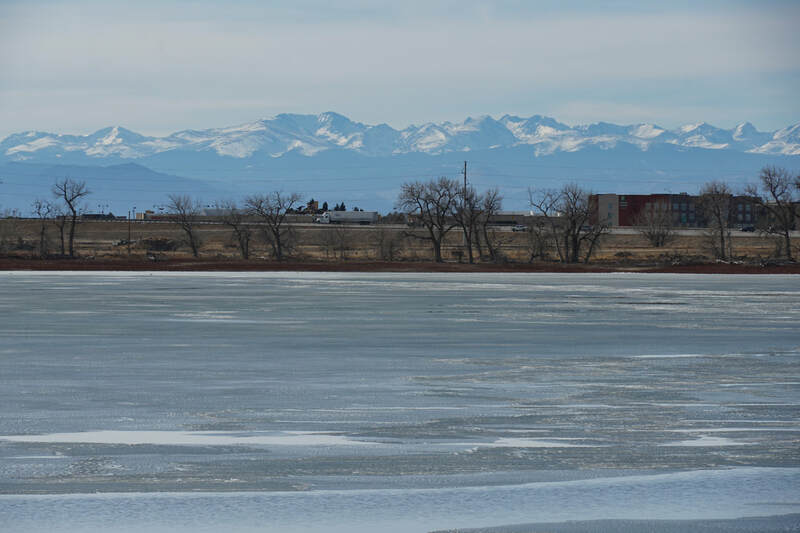 DIRECTIONS: From Colorado Hwy 285, turn north on Deer Creek Road (CO Rd 43). 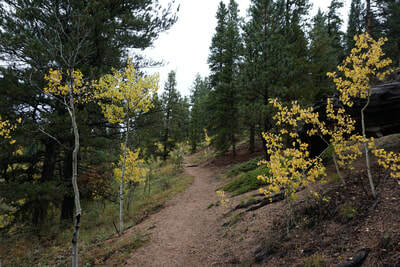 Follow 43 until the fork in the road with CO Rd 47 (Clark Road), bear right onto 47. 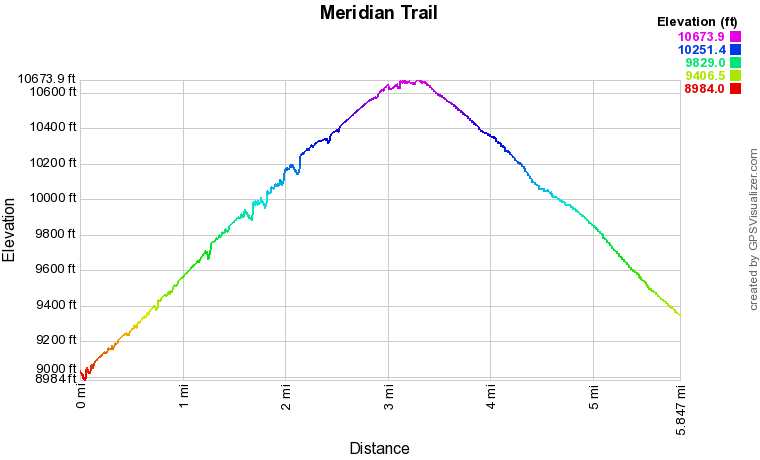 Follow 47 past the Meridian Campground and turn left onto Elk Creek Drive towards Camp Rosalie. Follow the dirt road for 1 mile to the trailhead. The road is in pretty good shape but it is very narrow and there are many large potholes, SUV is recommended. 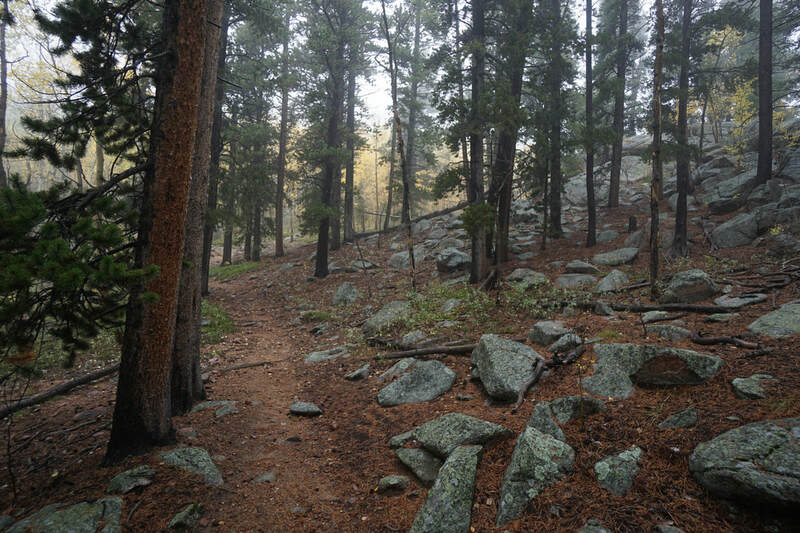 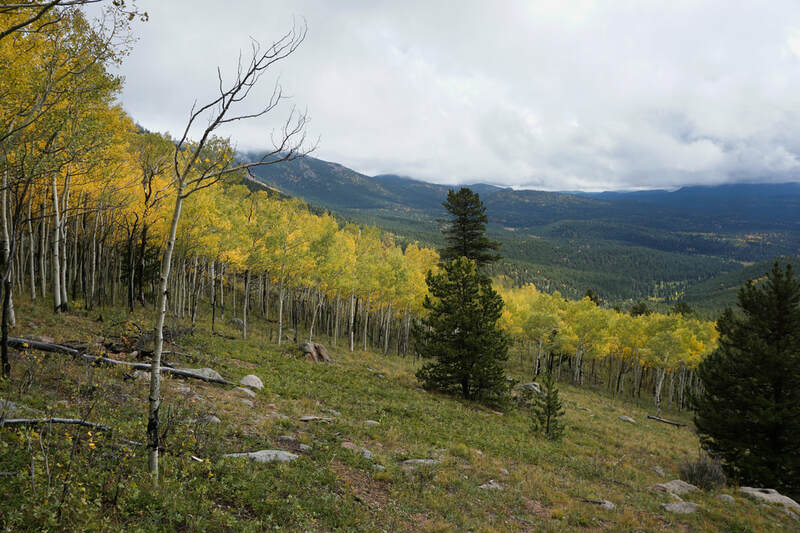 The Meridian Trail is an often overlooked trail that accesses the southern portion of the Mount Evans Wilderness. 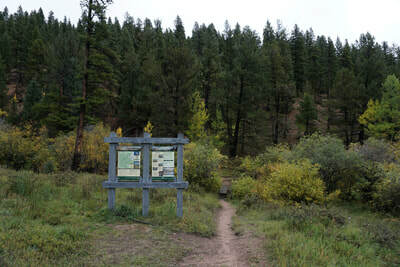 The trail climbs steadily to a forested saddle before dropping down into the wilderness area by connecting with the Cub Creek Trail. The trail is useful if you want to bushwhack to Meridian Hill (11,490 ft), Mud Lakes, or Rosedale Peak (11,825 ft). 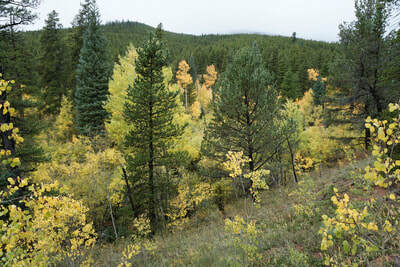 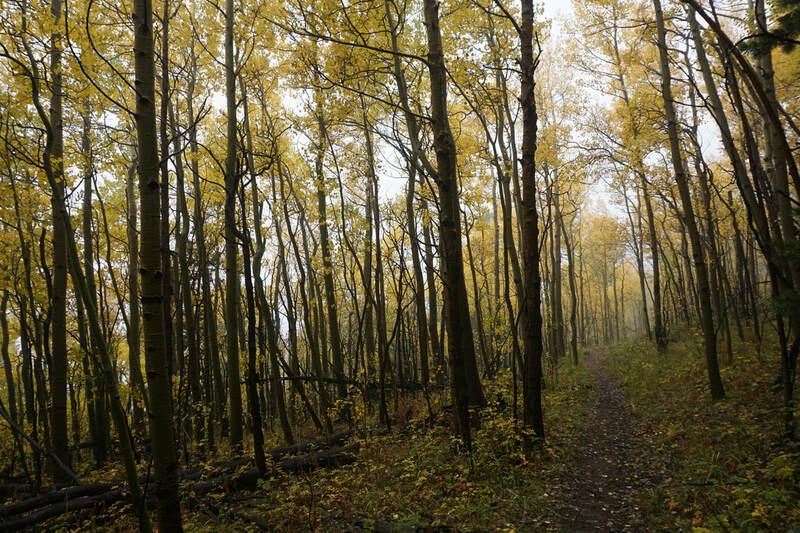 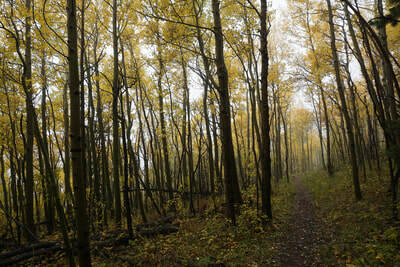 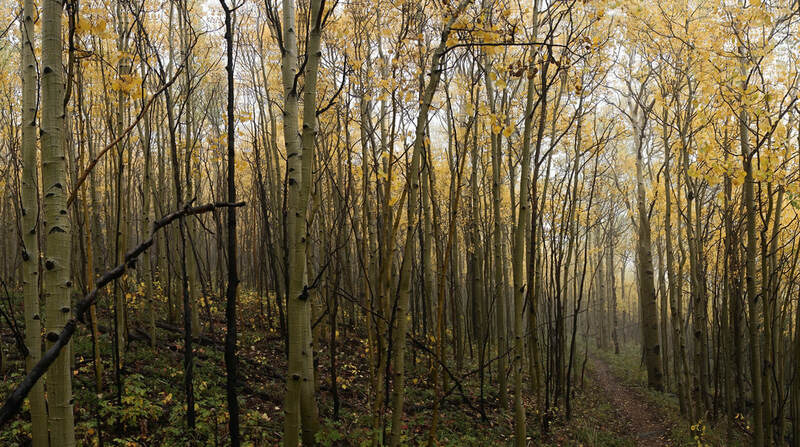 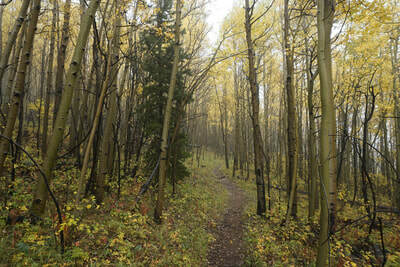 However, the trail's main appeal is the 3/4 of a mile long aspen grove about half way up the trail. 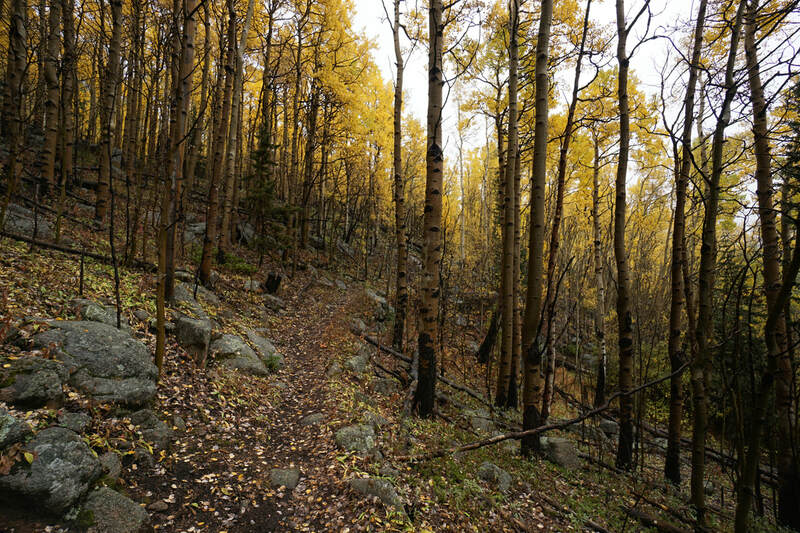 This trail is perfect for fall hiking. 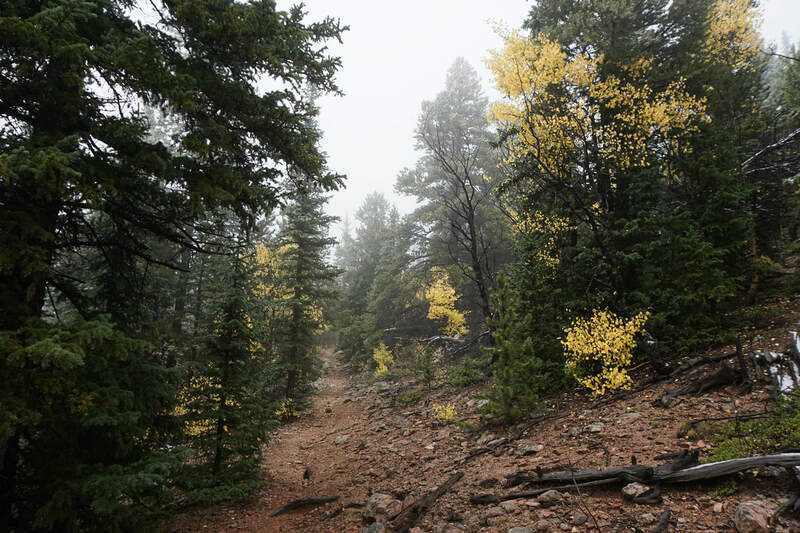 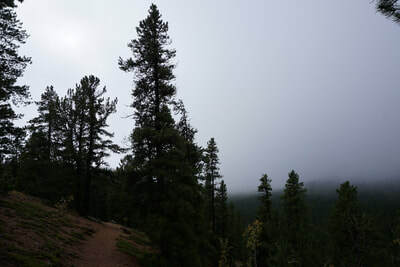 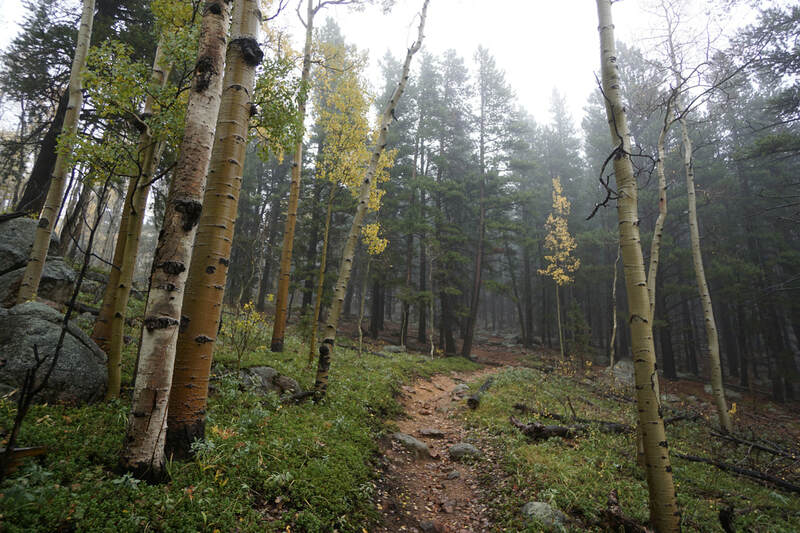 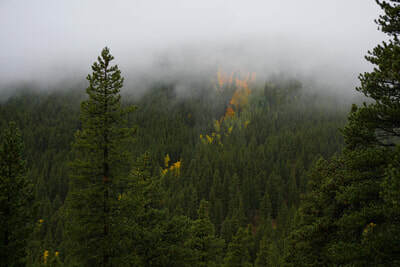 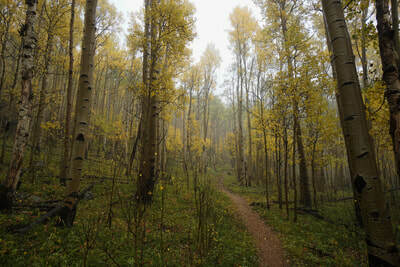 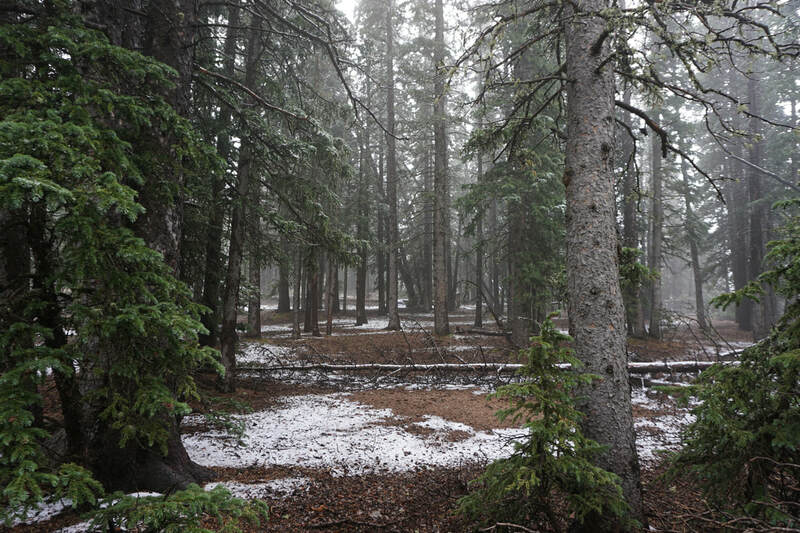 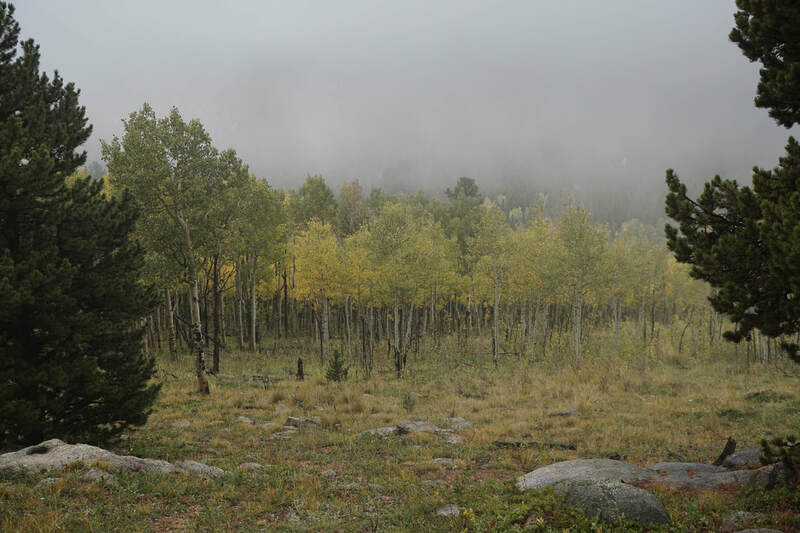 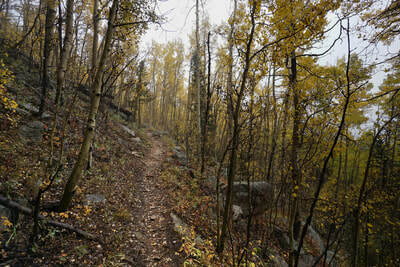 On the day that I hiked this trail the entire Front Range was covered in low hanging cloud so the forest was misty. 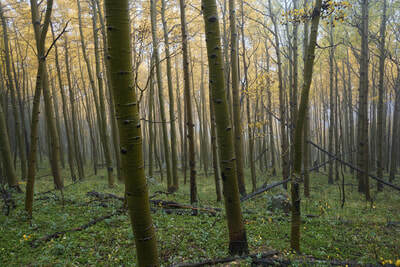 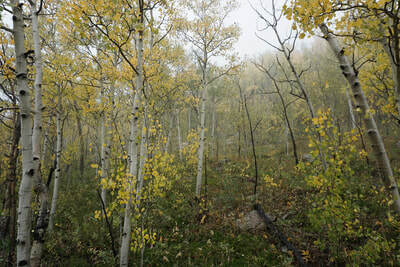 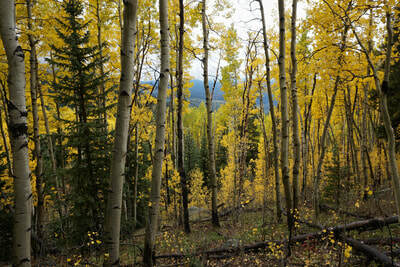 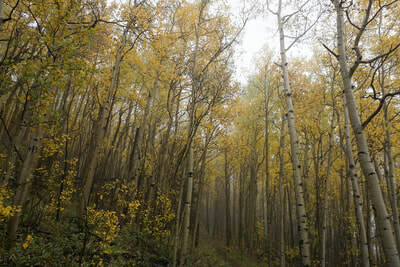 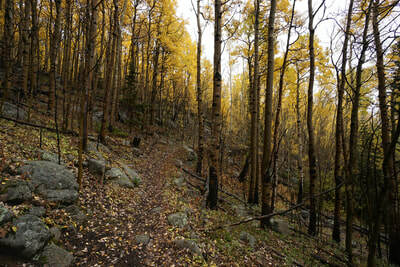 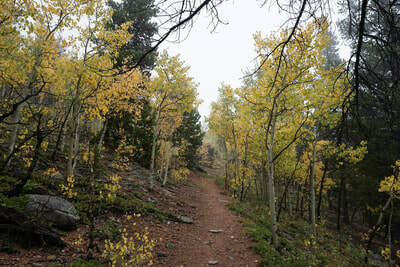 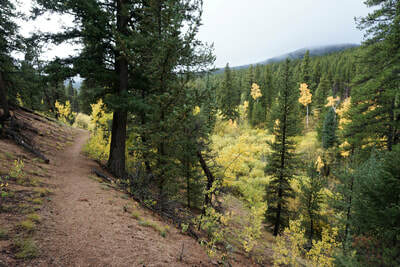 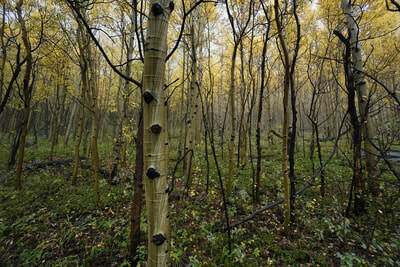 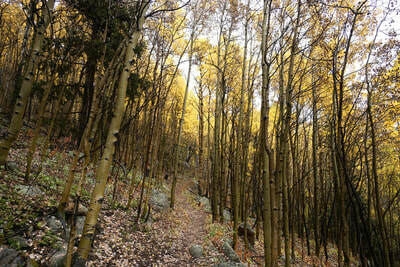 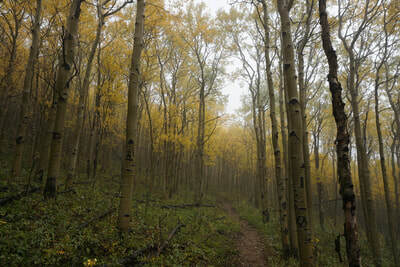 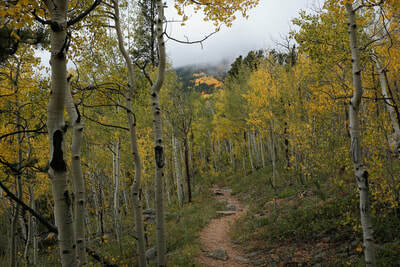 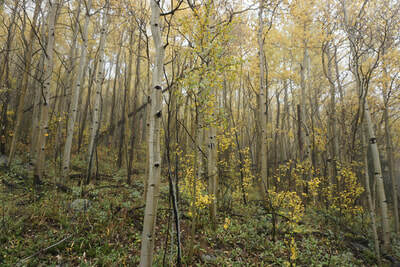 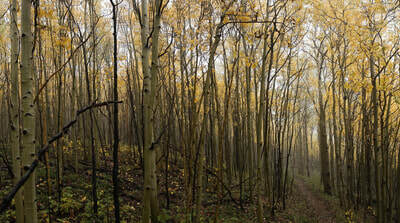 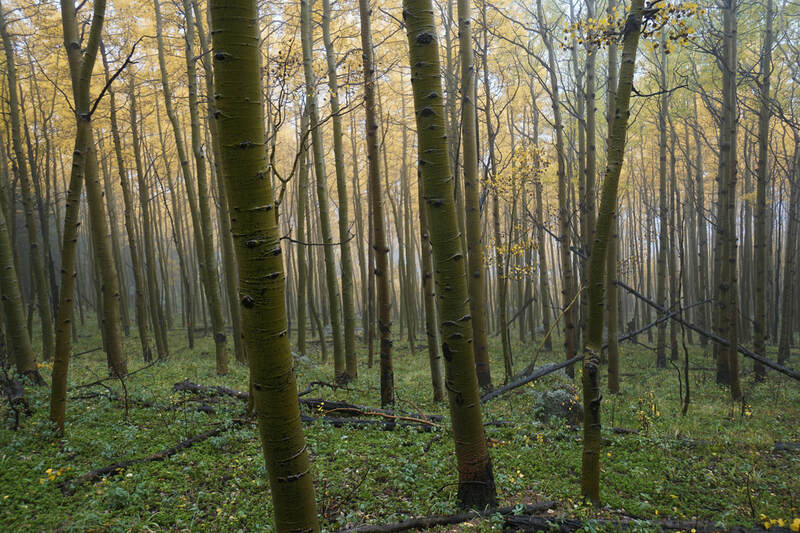 While the views were virtually non-existent, there were also few hikers and the aspen groves were still spectacular. 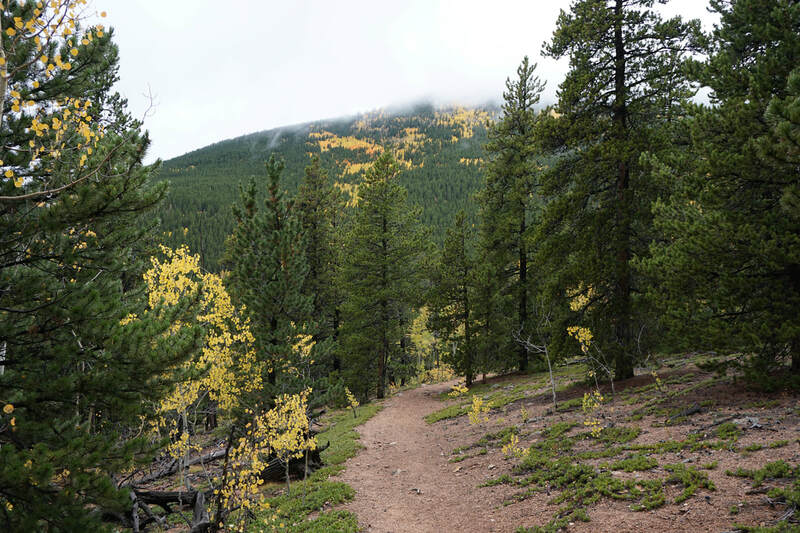 From the Meridian Trailhead, cross the creek and start the steady climb along the eastern slopes above Elk Creek. 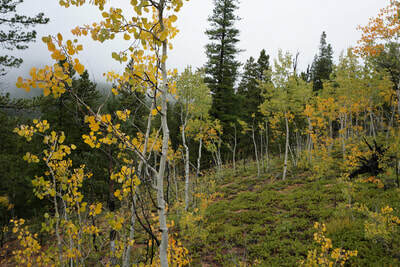 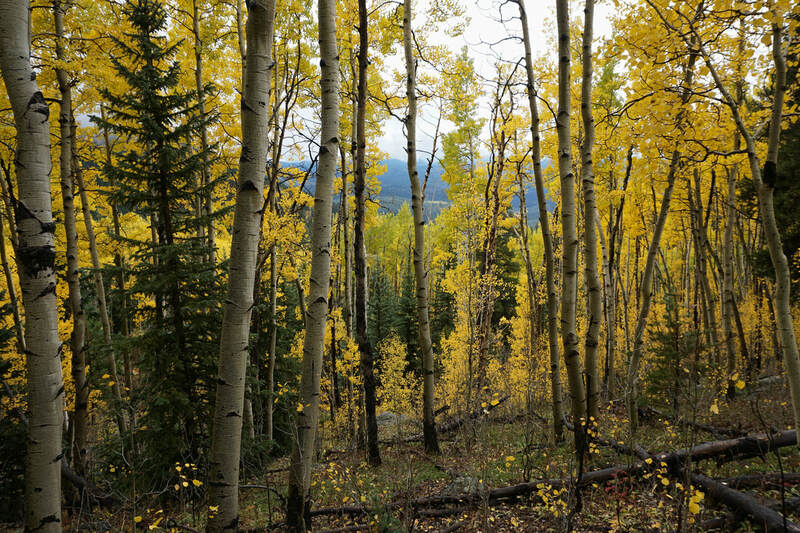 The trail traverses pine forest with beautiful patches of young aspen. 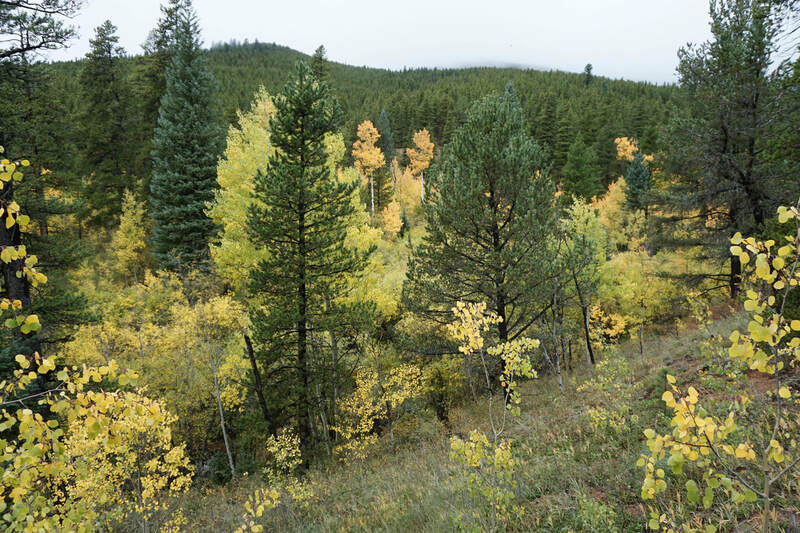 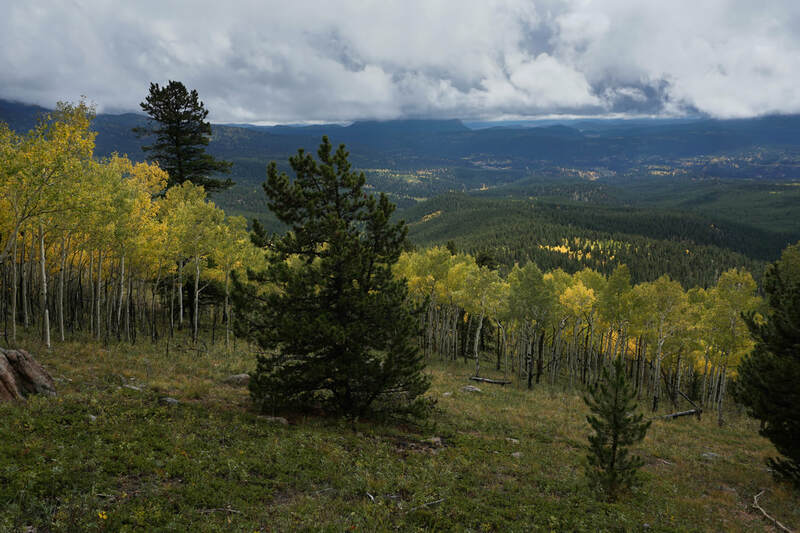 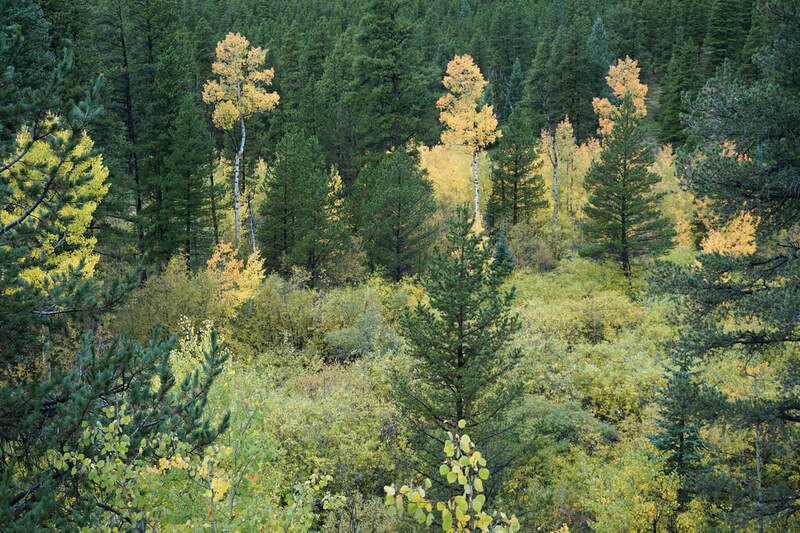 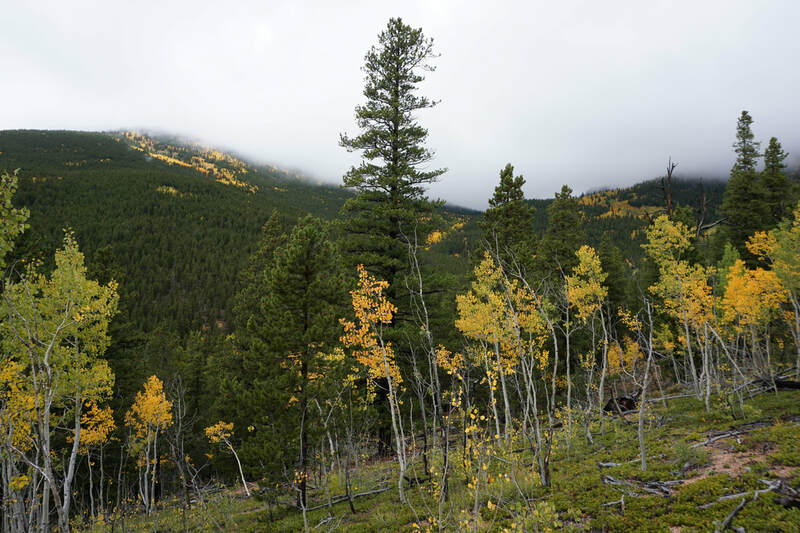 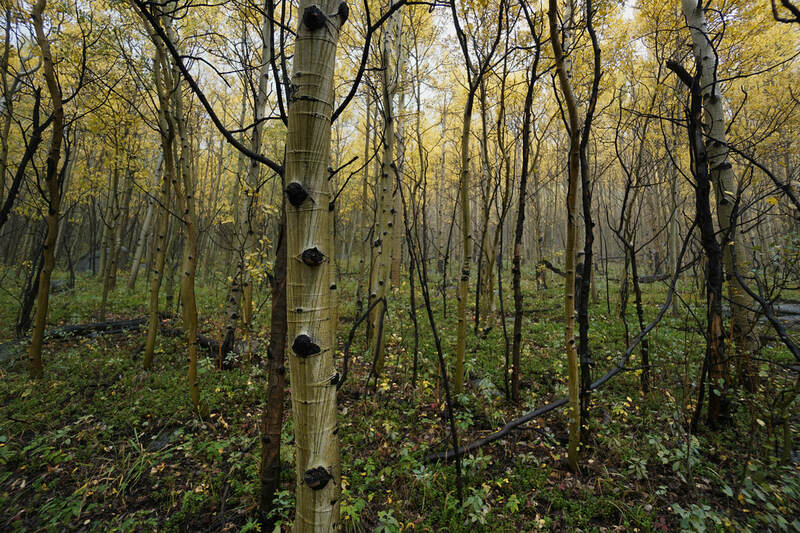 This area was once the site of a forest fire and aspen trees thrive in forests recovering from fires. 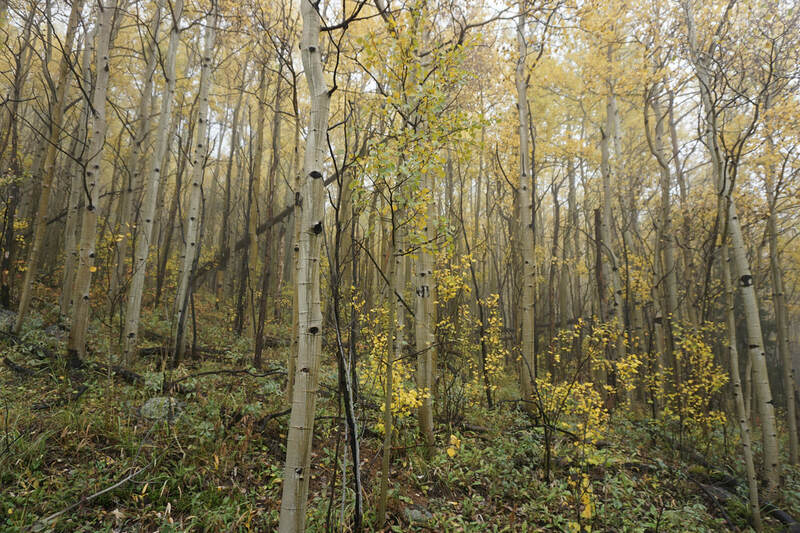 Wonderful aspen groves are also prevalent along the creek bed bellow and across the valley providing nice views as you hike. 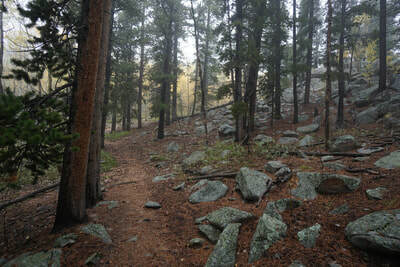 About 1.3 miles into the hike, the trail turns to the northeast and starts heading towards the saddle. 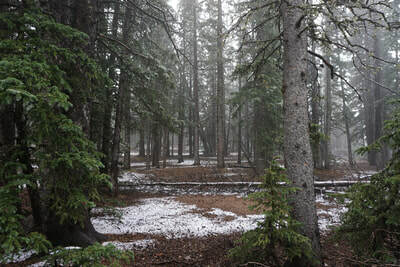 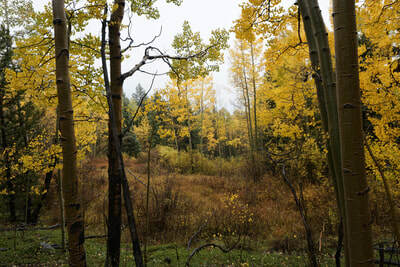 At first you will be tempted to leave the trail to explore the aspen groves that are just on the other side of the pine forest, no need, the trail will soon enter a magnificent grove, and stay in the grove for 3/4 of a mile. 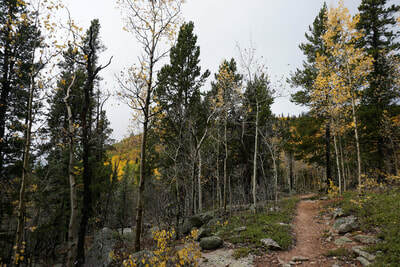 After just a few minutes of hiking and a creek crossing, the trail enters a young aspen grove dispersed among the pines. 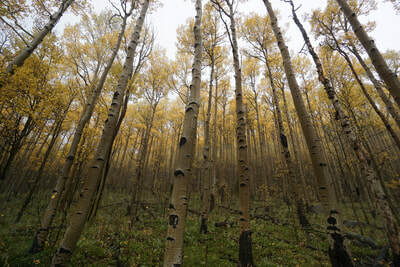 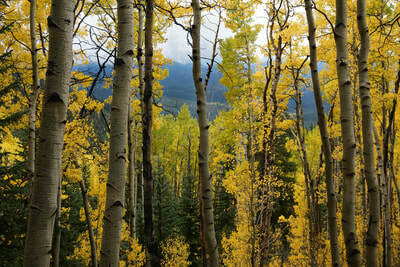 As you walk through the grove the young trees give way to a towering old growth aspen forest. 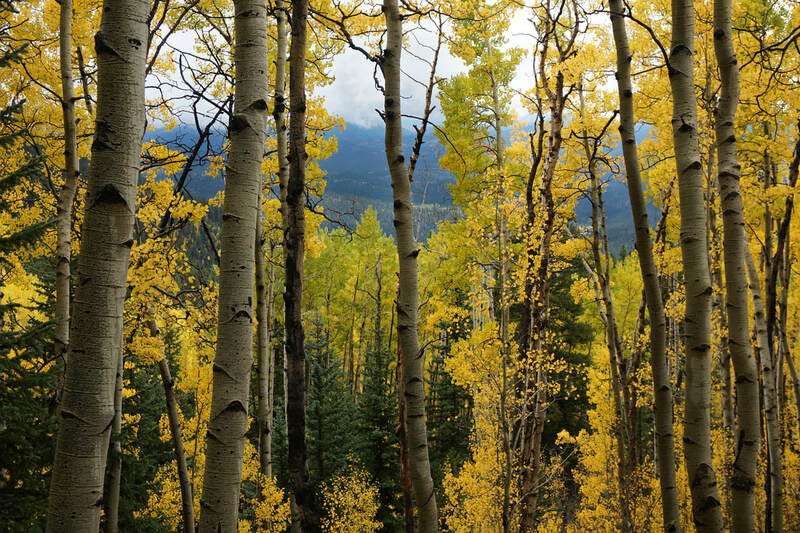 This aspen grove is truly magnificent if you hit it at the peak of the season, the canopy of golden leaves will take your breath away. There is a nice viewpoint through a clearing about halfway through the grove providing some of the only views of the surrounding area on this hike. 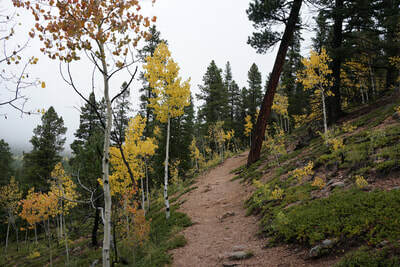 After this clearing the trail enters a pine forest and switchbacks through some boulders before re-entering the grove for one last stretch of aspen splendor. 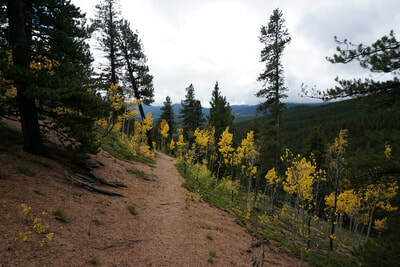 When you eventually leave the aspen grove, the trail continues through pine forest with dispersed aspens for another .8 miles until you reach the broad saddle. 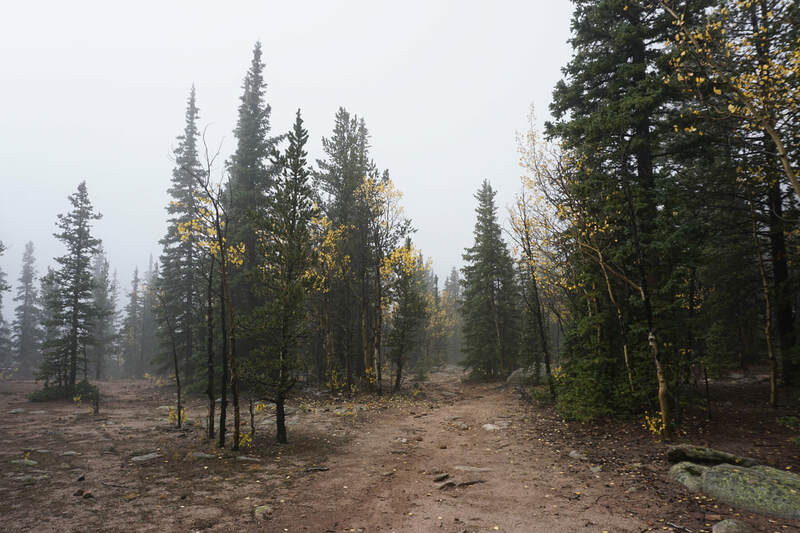 At the saddle, the trees get thinner and there just might be some views of the surrounding peaks (due to the cloud cover this is pure speculation...). 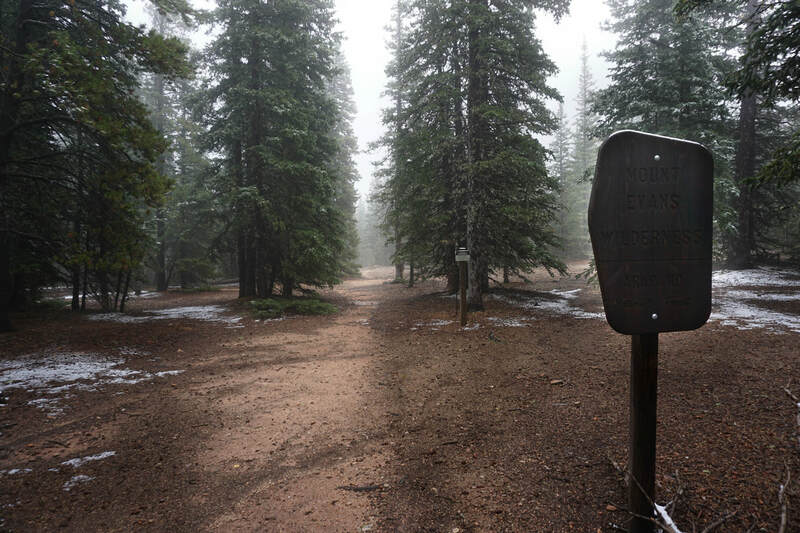 Just past the summit is the boundary of the Mount Evans Wilderness and if you continue past the boundary sign, you'll intersect with the Cub Creek Trail as the Meridian Trail comes to an end. 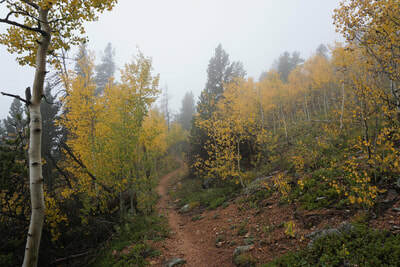 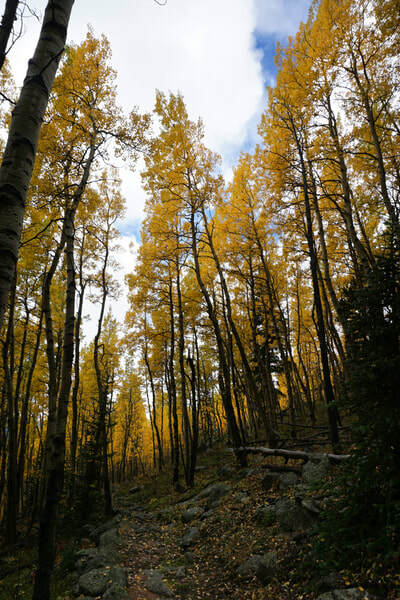 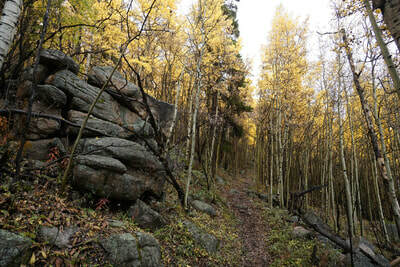 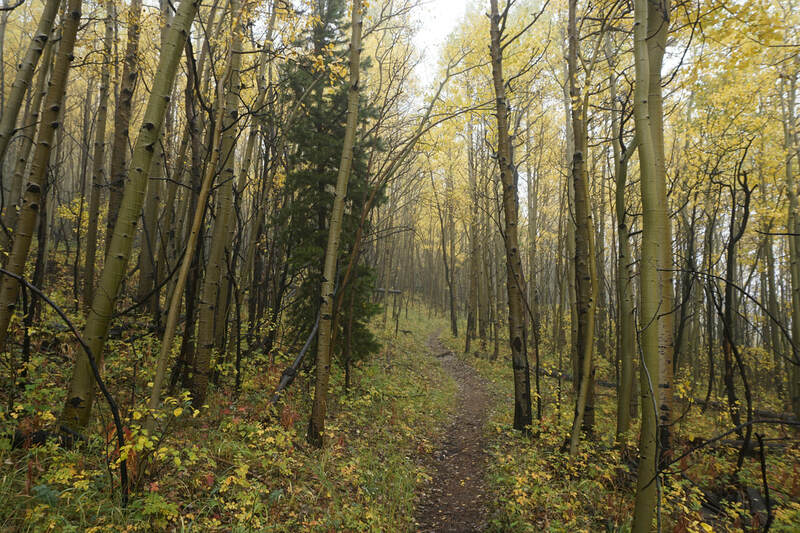 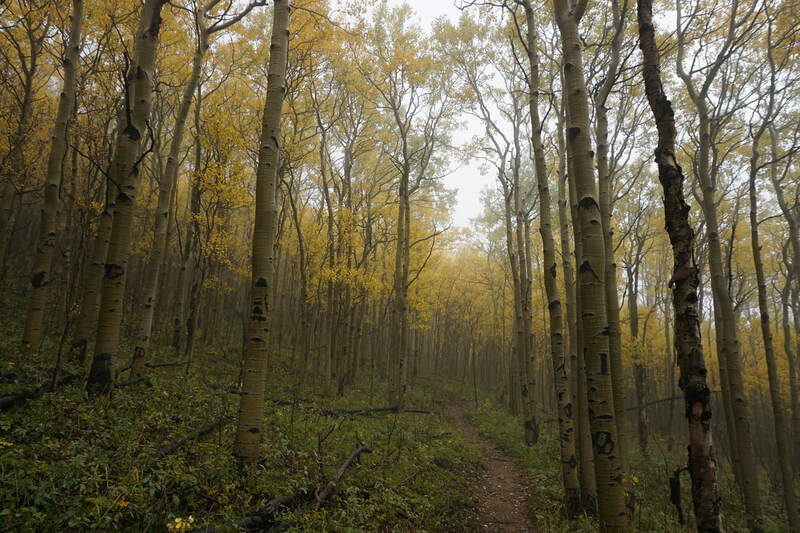 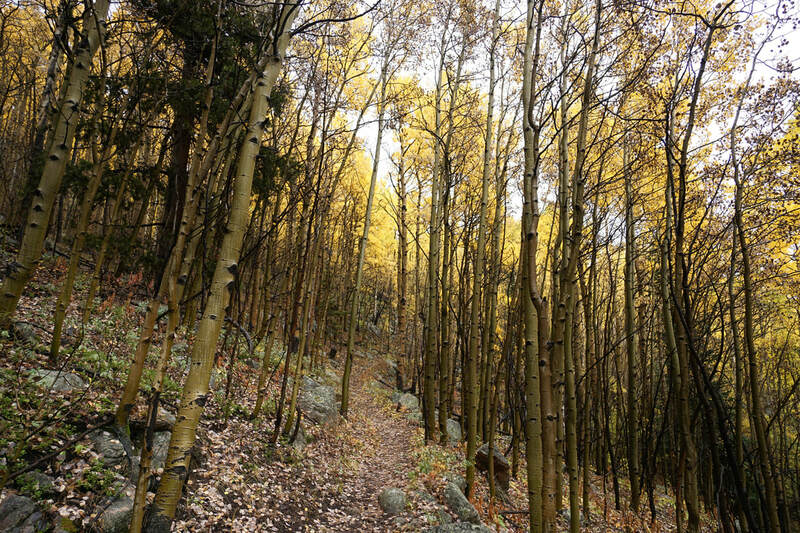 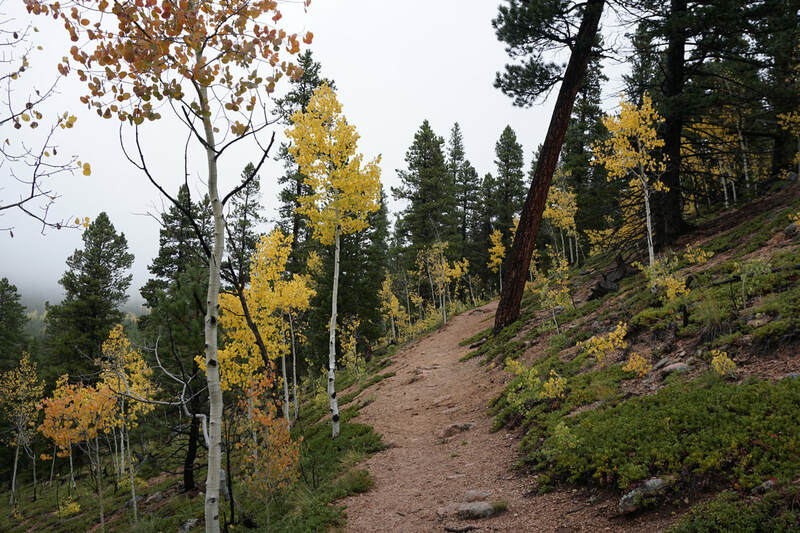 If you are not continuing on the Cub Creek Trail, then turn around at the saddle and enjoy your second traverse of the aspen grove on your way back down to the trailhead. 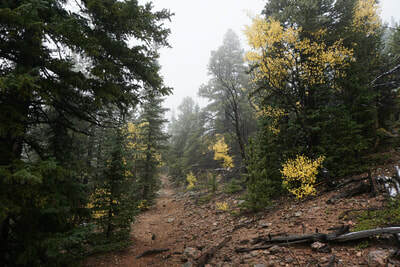 All in all this trail is perfect for fall hiking, the 6 mi (RT) distance is ideal for a half day adventure but you are climbing 1,800 feet in three miles so you get a good workout along the way. 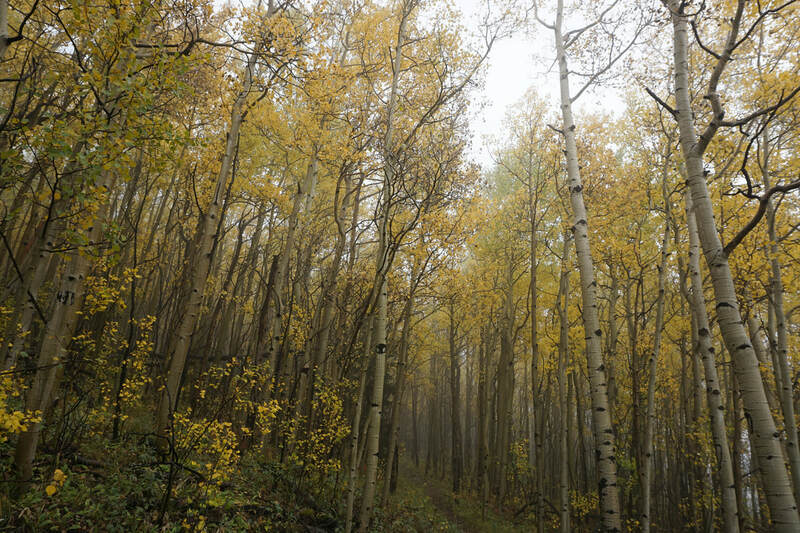 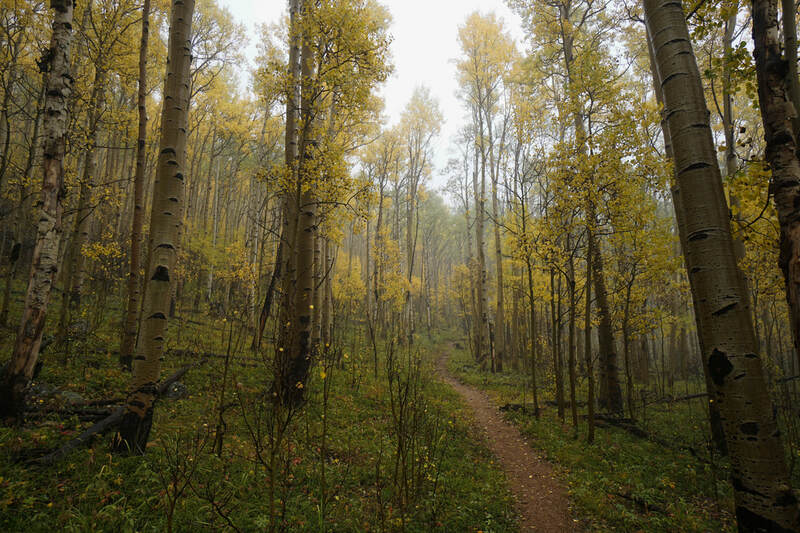 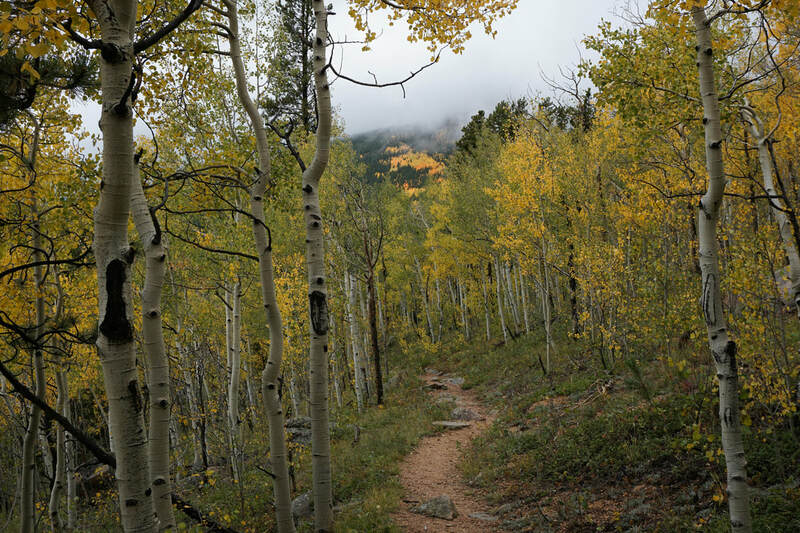 Don't let a little rain get in your way and enjoy the short lived aspen season.